In his book, The Black Swan: The Impact of the Highly Improbable, Nassim Nicholas Taleb writes of the black swan theory, unexpected events of large magnitude and consequence and their dominant role in history. A black swan is something that is usually rare, unpredictable, random and unexpected but invokes fundamental change when it appears. Perhaps more than any year in recent living memory, 2016 saw a multitude of black swans rearing their heads in almost every sphere of life. The political turmoil in South Korea, the rise of the Far Right in Europe, the battle for ISIS-held Mosul and fluctuating oil prices changed the geopolitical landscape. U.S. President Donald Trump sent shockwaves across the world with his strong anti-immigration and protectionist stance. Closer home, the Indian Army launched surgical strikes on the Indo-Pak border, ISRO launched 20 satellites in a single flight and one of India’s oldest and most venerable business houses found itself in the eye of a storm. Brexit and Demonetisation entered the global lexicon with the former threatening to destabilise Europe and the latter virtually turning the Indian economy on its head. And who can ignore the rise of the Millennials as they reach their prime working and spending years? The world’s first generation of digital natives, they are strong advocates of the sharing economy and have come of age during a time of technological change, globalisation and economic disruption. What does this mean for the workplace and what do companies need to do to remain engaged with this entirely new demographic? So, if we had to choose a single word to sum up the events of 2016, the sweeping changes that threatened to shake the very ground beneath our feet and the tectonic shifts in both geopolitical and socio-economic spheres, it would be Disruption. transforming the transportation industry, while Airbnb has harnessed the power of the Cloud and mobile technology to create a new market. In fact, business model innovation can be as disruptive as technology innovation and the future will see a convergence of both. So, how do we respond to this new world while ensuring we remain as agile as before? How do we tame the ‘demon of disruption’ as Anand Mahindra, Chairman, Mahindra Group described it at M101? This was a sentiment echoed by Anand Mahindra at the Conclave, as he outlined the 5 ‘S’ framework for disruption that would not only help the Group withstand the shocks of this new world order but also ensure it becomes anti-fragile. The first ‘S’ is the Shock Wave or ‘Shak Wave’ if we were to use the Hindi word for doubt. This implies that we need to create ‘shak’ or doubt within ourselves and question everything around us rather than succumb to a confirmation bias. The second ‘S’ stands for ‘Shadow the Shadow Board’ which refers to the importance of listening to millennials who, far from being fazed by disruption, tend to see white swans where black swans may exist. The next ‘S’ is ‘Small Pilots’ which is about sustained experimentation and deploying a proof of concept to arrive at the correct formula for success. Perhaps one of the most important ‘S’s’ that we need to keep in mind is the ‘Search for Beauty’ because beauty will never be disrupted and will always endure. We need to look at design and styling as a competitive advantage because they are both anti-fragile. The last ‘S’ and one of the most important in the framework is the ‘Search for Meaning’ because meaning, like beauty, is also anti-fragile and serves as an anchor. Creating a product or service that gives meaning to people’s lives is perhaps the greatest attribute of business. Mahindra may not possess the mystical powers of the Palantír or Seeing Stone, the magical crystal ball from JRR Tolkien’s The Lord of the Rings which would allow it to gaze into the future. However, by anticipating the future and working within the framework for disruption, we can strengthen our ability to be anti-fragile; this will allow us to extract the full potential of black swan events. A significant area in which the Group is strengthening its anti-fragile qualities is renewable energy. “We are currently focused on developing powerful electric drivetrains and solutions built around telematics which will allow us to create solutions for last mile connectivity, cargo operators and personal mobility. Connected EVs will help us develop a platform which will promote adoption of this technology at the mass mobility level and allow us to scale our operations across India and the globe,” says Mahesh Babu, CEO at the Bengaluru based Mahindra Electric which manufactures the e2o Plus and the eVerito in the personal mobility segment. The company has now set its sights on the fleet and cargo mobility segments with pilot projects in both areas. “We have partnered with Lithium Urban Technologies, a startup in the corporate service transport space with plans to build a fleet of 1000 EVs over the next two years. Lithium has been able to operate our cars profitably and prove that they are well suited for commercial use and we are now looking at passenger and freight transport as well. We have also deployed our fleet of eSupro vehicles to transport goods for Big Basket, India’s largest online grocery store,” says Mahesh. The next step is to get into mass mobility through e-buses and e-three wheelers. Another company that is quite literally making hay while the sun shines is Mahindra Susten which is harnessing the potential of the changing scenario in the energy sector across the value chain. “Renewable energy is disrupting the energy mix in India,” says Basant Jain, CEO, Mahindra Susten, the Mahindra Group’s Cleantech arm. “The Indian government has committed to develop 175 GW of renewable energy assets by 2022, with 100 GW of the target coming from Solar PV. Just to recap, we took a small step as an EPC player in the Solar PV industry in 2012 and today, we are playing a critical role in ensuring that India reaches this milestone. As of now, Solar has hit grid parity with levelized tariffs of Rs. 3.3 which is at par or lower when compared to any fossil fuel based power. Hence, solar is not just good for our environment, but also makes economic sense, ensuring India’s energy security. Solar - traditionally considered an intermittent source of power - is now, with the cost of storage coming down (through adoption of innovative technologies like advanced Li-Ion, fuel cells, etc.) not too far from becoming a truly 24 x 7 source of power. This will further accelerate deployment of renewable energy sources.” he continues. The company is also looking at tapping new avenues in addition to the Solar EPC business to pursue its quest for growth. “As of today, about 300 million people, ~ 28% of our population, have no access to electricity which inhibits their growth and development. We look at this as an opportunity to make a difference. To solve this problem, we are developing an affordable solution which is both disruptive and easy to use, with the ultimate aim to evolve this into a self-sustainable business model. We are also looking at the Infrastructure space, and our focus is to add sustainability right from the design phase to deliver a truly sustainable solution,” he says. “Today, we are predominantly focused on India and South-East Asia but we also want to expand our footprint across various geographies and are continually assessing market potential and addressing key risks,” says Firdaus Haque, Assistant General Manager, Strategy, Mahindra Susten. The company is using innovation and data analytics as the key levers to maintain its competitive edge in the renewable energy and sustainable infrastructure space. “One such step in this direction is incubation of MachinePulse – an IoT and M2M provider focused on the renewable energy space. MachinePulse is focused on developing products which offer our customers actionable insights, allowing them to maximize returns from their assets. SolarPulse is one such example which we have developed in-house for remote monitoring and analytics. It has an open architecture, is truly hardware agnostic and uses the latest analytical tools like machine learning, neural networks to leverage data to derive these insights. 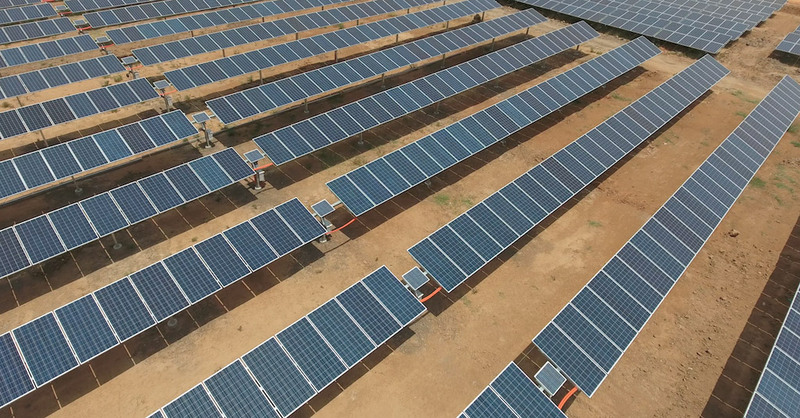 We have also developed a single axis solar tracker MSAT 100 (with six provisional patents to its credit) which uses proprietary technology to maximize solar energy generation as it ‘tracks’ or follows the position of the sun, leading to an increased generation of 18 - 20 per cent from the same solar PV plant infrastructure. We have developed the MSAT 100 as a global product and hope it will catapult us into the global solar market,” concludes Basant. Another company that is exemplifying the fifth ‘S’ or ‘Search for Meaning’ is the Farm Division which is working with the farmer to help him improve his yield through innovative platforms and services that make his life a little easier. In 2016, Mahindra launched Trringo, an innovative tractor rental service created on the platform of new-age digital technology. The model allows franchisees, equipment aggregators and equipment owning farmers to rent out their tractors and equipment on the basis of location mapping, ensuring optimum utilisation of these assets. Trringo will help drive the mechanisation of the Indian agricultural sector, enabling smaller farmers to access technology that can boost their yield. “Trringo is a bold move as it offers farmers the choice to rent instead of buying. This is significantly different from our current business model of outright sale, but we have to anticipate the movement of market forces to stay a step ahead of the competition. Also, Trringo can function as a platform to promote modern and often more expensive technology and equipment amongst the farming community, which they might hesitate to purchase outright,” says Ramesh Ramachandran, Senior Vice President – Strategy, Mahindra & Mahindra Ltd.
“Over the last few years, we have seen increasing adoption of technology in agriculture. In fact, with the advent of sensors and improved connectivity to the cloud, the possibilities have increased,” says Ramesh as he describes the future of agriculture. “This can bring an unprecedented level of data, science and precision to farming. For instance, a farmer can analyse the soil and understand how different sections of his field differ in terms of their nutrient needs. This data can be converted to a prescription map which prescribes what and how much fertilizer is required on different parts of his fields, thus enabling a more targeted strategy for better productivity, lower wastage and improved sustainability. This fundamental change will be driven by digitization as we need to be able to process vast quantities of data very quickly, run analytics and deliver simple, actionable advice to the farmer, leading to disruption in the industry. Offering such actionable advice is indeed the objective of Mahindra’s agri-business which recently also launched MyAgriGuru which offers one click access to farmers on relevant information such as region specific agronomy, market prices etc. A huge amount of processing power and the ability to create relevant AI models is required for such initiatives,” he says. Similarly, autonomous technology and robotics can also potentially revolutionise the farming space in terms of new farm equipment such as driverless tractors and robotic sprayers. Some of these tech disruptions are driven by the Cloud, while others are driven by high tech hardware. “So, disruptions really come to life when you think of how software and hardware can come together in agriculture to create new ways of farming that are supported by completely different business models,” concludes Ramesh while painting a picture of how technology can potentially transform the business. In the next few years, the company aims to create stronger on-ground presence in various geographies using a proactive inorganic growth strategy. Recently, it made strategic investments in companies like Japan’s Mitsubishi Agricultural Machinery and Finnish Combine Harvester company, Sampo Rosenlew which will help it create a more global business. Just like the Farm Sector, Mahindra’s Auto Sector has also been pioneering several digital innovations in customer facing processes to deliver a delightful customer experience. “As a leader in the ‘Small Commercial Vehicle (SCV)’ segment, we realized that we should innovate and create disruptive business models to stay ahead of the competition. The SCV market is expected to reach 1 million units by FY2021 thanks to exploding Indian middle class consumption. Based on extensive consumer in-sighting and market research, a disruptive digital business model called ‘SmartShift’ was launched. This model enhances earning potential for the drivers and drives market efficiencies,” says Kannan Chakravarthy, Senior VP, Strategy and Special Projects, Mahindra & Mahindra Ltd.
Based on the reverse bidding system, SmartShift is a first-of-its-kind load exchange platform for Small Commercial Vehicles which connects businessmen wishing to transport cargo with transporters in their immediate vicinity. The platform is transparent in nature and enables contact, negotiation and closure of the deal between both parties at the click of a button. SmartShift aims to enhance efficiencies in a fragmented market and reduce cost and travel time. 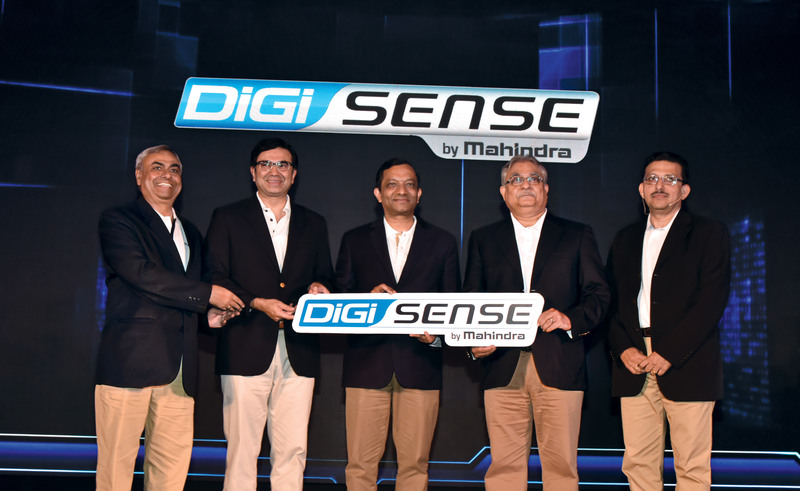 It was, however, in August 2016 that Mahindra became the first Indian OEM to create a unified, cloud-based technology platform for its entire mobility sector when it launched DIGISENSE. “At present, there are three trends dominating the automotive industry, namely autonomous technology, shared mobility and connectivity. DIGISENSE is aligned with the third trend and is part of our focus on macro level digitisation of our vehicles. “It harnesses the power of the Cloud, and in the future it will combine AI and analytics to deliver realtime data on the performance of the vehicles to both customers and service teams.” The platform is based on an open architecture model which allows us to enhance its features from time to time,” says Dr. Aravind Bharadwaj, Head – Technology, TPDS, Auto & Farm Sectors, Mahindra & Mahindra Ltd. “DIGISENSE is the first such platform to be deployed in the farm space in India and has been well received by farmers who have appreciated its geosense feature which allows them to track the movement of their tractors at all times, especially when they have been rented out,” explains Aravind. current way of doing things and make the organisation more agile,” he adds. All great initiatives to keep the workforce and especially Millennials engaged. To push newer technologies and increase engagement with startups, Tech Mahindra has formed the Growth Factories unit which aims to crowdsource solutions to customer needs and problems in various verticals like healthcare, telecom, manufacturing, etc. “These can be fresh ideas or co-created along with customers; the idea is to incubate the technologies of the future and eventually take them to market,” says Jagdish who heads the unit. “We also need to embrace disruption from outside and are actively looking at the start-up space for platforms and ideas. For instance, TechM Nxt is a small unit in Silicon Valley that links smaller start-ups and helps them collaborate to deliver solutions for our customers,” he says. In 2015, Tech Mahindra acquired legendary Italian design firm, Pininfarina, reinforcing its vision of a world of Connected Solutions. This was followed a year later by the acquisition of the UK based BIO Agency which specialises in digital transformation and innovation, helping organisations change the way they engage with their customers. “We aim to create a world where the physical and digital will converge to enhance the customer experience, in line with our brand positioning of ‘Connected World. Connected Experiences’ Along with Pininfarina and BIO we aim to create a beautiful experience in the tech world,” says Jagdish, validating the fourth ‘S’ in the framework or the ‘Search for Beauty’. While restrictions on H1B Visa holders would definitely be an area of concern for the company, there are several aspects that will enable Tech Mahindra to emerge stronger. “Our dependency on North America is amongst the lowest in our peer group, acceptance of technologies like cloud and mobility and growth of collaboration platforms like Skype and Telepresence will also spawn new business models and new ways in which Tech Mahindra will adapt and grow the business,” he says with a note of optimism in his voice. THE SCV MARKET IS EXPECTED TO REACH 1 MILLION UNITS BY FY2021 THANKS TO EXPLODING INDIAN MIDDLE CLASS CONSUMPTION. The company has also built its own platforms in the area of robotics, IoT, analytics and automation which will get accelerated in alignment with Tech Mahindra’s focus and investments towards being a global leader in DevOps, customer experience and IoT. Moreover, Tech Mahindra operates in multiple geographies which implies that it can deploy technology and skill sets from anywhere, ensuring it remains agile as the tech landscape changes. This keen focus on developing platforms within Mahindra is aligned with the hypothesis of Boston University Professor, Marshall Van Alstyne. As a keynote speaker at M101, Marshall held forth on the emergence of platforms which are slowly taking precedence over products. “If we go back about 15 years, we see that the most valuable companies in the world were mostly from the banking or energy domains. Fast forward to today and we see that the companies dominating this list are all platform companies, i.e. companies that are dependent on an external eco-system. So, whether we consider market cap, speed, agility or fame, platform companies are becoming a dominant force in the economy,” he says. So, what changes do we need to bring about in the workforce to equip them to develop their own anti-fragile capabilities and respond to this new disruptive environment? 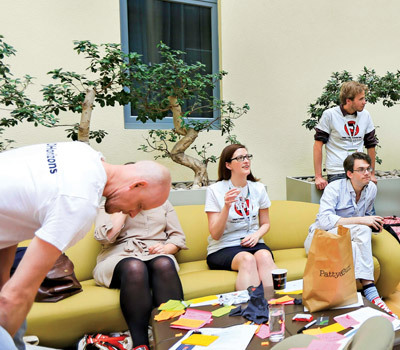 How do we redesign the workplace to make it more agile to meet the needs of Millennials? Rajeev Dubey, Group President - HR & Corporate Services, CEO – After-Market Sector, set the tone for this discussion at M101 when he said, “At the core of disruptive companies is their talent and when we talk of talent it is clearly Millennials that we need to watch out for. They already comprise 50 per cent of Mahindra’s workforce and that figure is only set to rise. 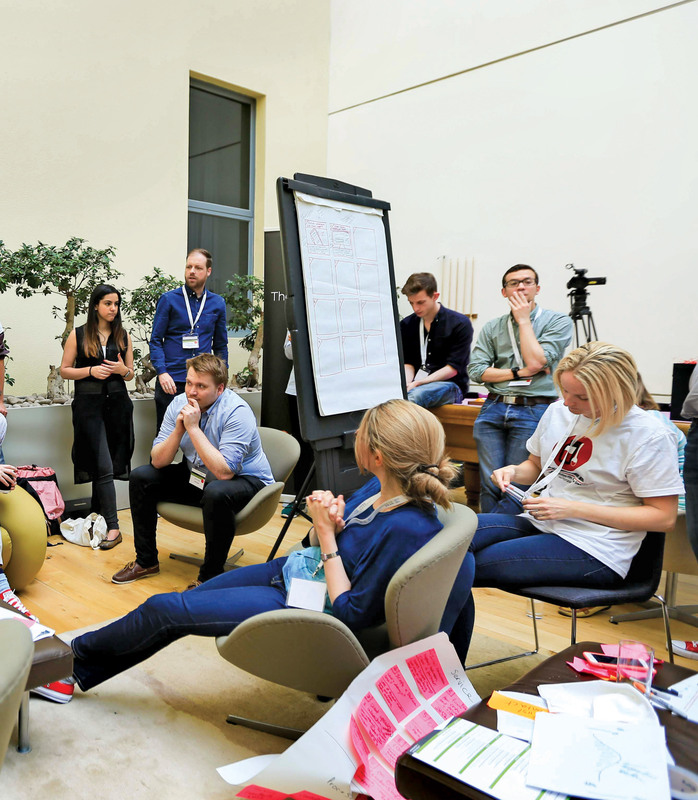 This gives rise to three questions, namely: how do we attract the kind of talent that we need in the Age of Disruption, how do we retain them and how do we unleash their potential? If we listen to the voice of the Millennials we will see that they want to belong, be heard, keep learning and growing in their job, have varied experiences and, above all, make a difference. Culture is oxygen for them. Strategy, structure, metrics and processes are of course necessary to help us relate to Millennials but if we want to arrive at something really core that will distinguish our talent from others, the mool mantra is to create passion through meaning and empowerment. This can only come from culture, which is the way people behave in everyday life especially as they go about taking business decisions. Rajeev went on to articulate the 3 + 5 framework which would help us respond to disruption at the workplace. The ‘3’ refers to our three Rise pillars – Accepting No Limits, Alternative Thinking and Driving Positive Change which together lead to sustainable competitive advantage. The ‘5’ refers to five behaviours that we have identified which, if lived by our leaders, will bring the three pillars to life and lead to sustained outperformance and passion. of fear, where every failure and deviation from the norm is penalized. When there is risk, there will be failure; what is important is not whether we fail but what we do to leverage the learnings from these failures to create success. Hence, we need leaders who will manage fear and leverage the learnings from failure. The fourth is mindfulness, being open to all possibilities and listening to the voices of the consumer, the marketplace, the community and competition. This is not possible unless one is fully here and now and not trapped by one’s own past, either success or failure. And last, but not least we need our leaders to create trust which is only possible through authenticity, by walking the talk and removing the mask. Without trust, we will never have transformation and will fail to inspire Millennials. If we establish this 3+5 framework and live these behaviours, it will pay us rich dividends to create the talent that we need in the Age of Disruption. The Age of Disruption is clearly not an easy one to negotiate. It brings previously unforeseen challenges that call for a fundamental change in the way we approach business and the world around us. It calls for us to be more agile and responsive to change, as we anticipate each bend in the road, the twists and turns on the path to success. But throughout its long and chequered history, the Mahindra Group has proved time and again that it can take on the demons of disruption, whether it was in 1991 when Liberalisation opened India’s economy to the world or prior to that during the License Quota regime. Perhaps the last word belongs to Anand Mahindra who quoted from a poem written by W.H. Auden titled September 1, 1939, the date when the Nazis invaded Poland, signaling the start of World War II. Though beginning on a sombre note, these lines which have resonance even 78 years after they were first penned, end with a sentiment that is full of hope.